I love hair. Specifically, beautiful hair on the heads of awesome characters. Hair makes a powerful impact on how a character is perceived and acts as subtle exposition for their personality. Good hair takes time and effort. The greatest hair requires dedication and a certainty of purpose to create and maintain. The world is suffocating under the weight of 'safe' male haircuts. Hairdressers across the globe are getting Repetitive Strain Injury from the endless stream of short back and sides they are forced to dole out. It takes true vision to create an iconic hairstyle for a character, a real commitment to complex storytelling. They all stand head and shoulders (pun intended) above their rivals. The characters in this list not only have beautiful hair, their hair is complex and provides fascinating insight into their lives. James Buchanan Barnes' hair is a perfect mirror for his personality, dark and beautiful. He is a magnificently tragic character, straight out of Greek myth. His life is stolen and he is forced to do terrible things. He is an extraordinarily brutal and animalistic fighter and his hair reflects his chaotic violence by transitioning from calm and smooth to flying all over the place. Billy’s appearance is perfectly measured and deliberate in every second he is on screen. The hair is arguably one of the most vital parts of his persona. Even when naked his hair is remarkably poised and purposeful. Viewers of the show will understand the trauma that Billy uses his facade to mask. This facade is stripped away when Frank fires a bullet which ricochets into his perfect face. The real, terrifying billy emerges in that moment and his appearance loses its importance, replaced by his rage. His hair is clearly genetically engineered to be... Better. (Than whose?) Everyone’s. 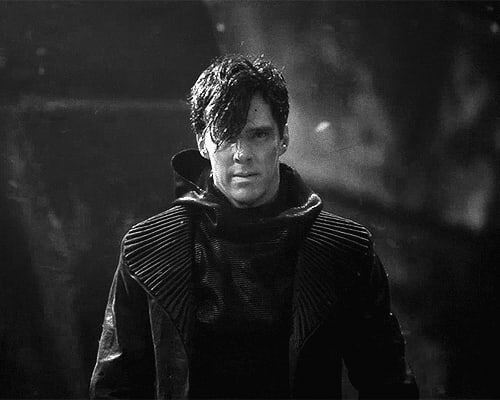 Look at these two shots of Khan. The message in this transition tells you a lot about the character. These two shots take place seconds after each other. In between the scenes Khan is handcuffed and marched through the ship. Somehow, in that period his hair is dried and sculpted into a perfect comb-over style. He is just beautiful and powerful. Perhaps this too is down to his genetic superiority. Ragnar Lothbrok is probably the manliest man in history. His physical presence and icy blue eyes make him the effortless focus of any scene. The legendary Viking also has legendary hair. A bald, heavily tattooed undercut with long, braided hair that stretches half way down his back. I wonder if the men learned to braid when they were children like the women. Whether he braids his hair himself, how long it takes? His hair is another extraordinary arrow in his considerable bow. Benedict Cumberbatch should be lavished with awards for this role. I am proud to contribute a new one to him. Single pictures can’t do these hairstyles justice, I suggest you watch/re-watch these films and shows and take special notice of the glorious hair on display. Next time you think about a trip to the barbers, think what you want your hair to say about you. Look for inspiration and don't be afraid of what feels right for you. Next time you think about a trip to the barber's, think what you want your hair to say about you. Look for inspiration and don't be afraid of what feels right for you. * I wonder if combat hair choreography is a thing? It can’t be luck that these characters hairstyles take on lives of their own when their owners fight. Is This The Coolest Supervillain Lair Ever?